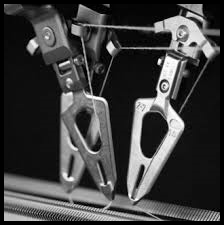 InnovaKnits specializes in Sample Development and Product Creation right here in the USA, combining the latest State of the Art equipment with our 30+ years of expertise to offer our customers unique solutions in flat knit textiles! Recent development projects have focused on the following capabilities / specialties: 3D / multilayer knitting, complex intarsia patterning, weft and warp inlay of elastics, weft and warp inlay of conductive yarns / wire, plating and feeding of bare spandex, knitting with silicone yarns, knitting with high strength uhmwpe yarns, knit uppers, and biaxially reinforced fabrics. We sign NDA’s with all customers we do development business with, and our customer’s names and projects are held in the highest confidence. Our On-Site Design and development is performed in a separate facility that is locked and inaccessible from the rest of the factory. In addition to development services, we also offer in-bound and out-bound training and consulting services to our customers available on an hourly basis. Please fill out the form on the CONTACT US section of this website to get started on your latest project or idea, and we will get back to you within 24 hours to further discuss your needs.